Often outshouted by versions from California and Europe, the Rieslings, Chardonnays, Cabernets, Merlots and Syrahs of Washington can deliver pure fruit flavors and distinctive character at prices that don’t break the bank (psst, pass it on). Argentina: A free chart offers an alphabetical list of all Argentina wines reviewed for the tasting report in this issue. FREE: Washington Alphabetical Listing - More than 660 wines were reviewed for this report. A free alphabetical list is available. WineSpectator.com members can access complete reviews for all the wines tasted using the online Wine Ratings Search. FREE: Argentina Alphabetical Listing - More than 640 wines were reviewed for this report. A free alphabetical list is available. WineSpectator.com members can access complete reviews for all the wines tasted using the online Wine Ratings Search. WineSpectator.com: BONUS VIDEO: The Cheval Connection: Two top wines, both named Cheval-one in Bordeaux, the other in Argentina. Get the story behind them with Pierre Lurton of Château Cheval Blanc and Nicholas Audebert of Cheval des Andes. Health Report: Moderate Drinking Linked to Longer Lives, But Is It the Wine? 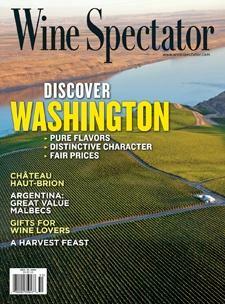 WineSpectator.com: Build your cellar through smart bidding. Use our online Auction Price Database to track the performance of more than 12,000 collectible wines. Check the results at the latest major sales with our Auction Highlights section, which spotlights lots that sold for above- or below-average prices. Find them at www.winespectator.com/collecting. WineSpectator.com: In his blog, James Laube discusses the late and light 2010 harvest in California, pays tribute to a Carneros Pinot Noir visionary and highlights a new star in Sonoma. Join the conversation with other members. Matt Kramer - Second Life for Corks? WineSpectator.com: In his blog, James Molesworth introduces you to winemakers and wineries worth watching, from Bordeaux's Gruaud-Larose and Monbrison to Frenchmen and Kiwis working in Chile to the leaders in New York's Finger Lakes. Scott Anderson’s Spaghetti Carbonara With Beaujolais - Chef Scott Anderson, Elements, Princeton, N.J.
Top 10 Countdown:On Monday, Nov. 15, WineSpectator.com will begin revealing the Top 10 wines, culminating with the Wine of the Year on Friday, Nov. 19. Each unveiling will be accompanied by a video explaining why the wine was selected. After the countdown, we'll provide a printable list of the entire Top 100, complete with wine name, rank, score and price. Free Site Access: As a bonus during the Top 100 period, we'll be offering all visitors free trial access! Be sure to check out all our website's members-only features-including tasting notes for all the Top 100 wines-from Nov. 15 to 28. Don't miss out! HOLIDAY GIFTS AND ENTERTAINING Get great ideas for the wine lovers among your friends and family. Plus, we'll help you impress your party guests with crowd-pleasing wines and delicious recipes. Spain—Tradition and Innovation: Learn about the traditional Ribera del Duero region and its wine styles from innovative vintner José Manuel Ortega Fournier of O. Fournier. THE GIFT OF WINE EDUCATION Give a gift of WineSpectator.com membership this holiday season and your loved ones can take any or all of our Wine Spectator School online courses-from the ABCs of Tasting to in-depth seminars on Food Pairing, California Cabernet, Bordeaux, Tuscany and more. Browse the course catalog. TRAVEL ADVICE Going away for the holidays? Find out which North American wineries, wine-country hotels and wine-friendly restaurants our editors recommend, plus learn what fellow readers think of them. Share your own ratings and reviews when you return.